Album/CD cover for Tina Turner's 1991 'Simply the Best,' a compilation of her 1980s' hits. She walked away from her husband and a successful musical career with some loose pocket change, a gasoline credit card, and little else. It was early July 1976, just after the 4th. For a time, she relied on friends and food stamps to survive. But Tina Turner never lost her moxie or her musical compass. She rose from the ashes of her earlier troubles, having endured years of physical abuse and indignities in a marriage and professional music relationship with her partner and husband, the late Ike Turner (charges which he disputed). Picking up the pieces and taking control of her career, Tina Turner worked her way back into the entertainment world she loved. By the mid-1980s, she began one of rock ‘n roll’s greatest second acts ever, gaining the respect of the music community and beyond with a stunning comeback. Her story has been chronicled in both the best-selling 1986 book, I, Tina, and the Oscar-nominated 1993 film, What’s Love Got To Do With It. By 2005, Tina Turner had become one of the most successful female rock artists of all time, with record and CD sales in excess of 180 million copies. Her live performances from the mid-1980s through 2001 set audience attendance records from London to Rio. In fact, she sold more concert tickets in that period worldwide than any other solo performer in history. During those years, Tina Turner became the economic equivalent a modest-size corporation, generating revenues well north of $500 million. She didn’t do it alone, of course, but her personal odyssey and successful comeback resonated with millions of fans, friends, and admirers. As Oprah Winfrey put it at the 2005 Kennedy Center Honors celebrating Turner’s achievements: “Tina Turner didn’t just survive, she triumphed.” Consider first, her beginnings. 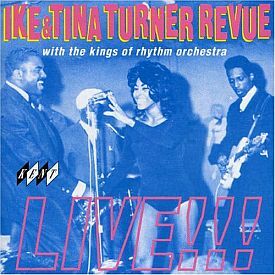 Cover of recent CD captures the happier days of the 1960s & 1970s 'Ike & Tina Turner Revue'. Ike shown at right. Born Anna Mae Bullock in Nutbush, Tennessee in 1939, Tina Turner’s first act as a rock ‘n roller came at the age of 19 when she linked up with St. Louis guitarist Ike Turner in 1958. Turner gave the young girl the stage name Tina and also married her in 1960. Through the 1960s and 1970s, the Ike & Tina Turner Revue did quite well, playing just about anywhere. They opened for acts like the Rolling Stones, appeared on national television, and hit the pop and rhythm and blues (R &B) charts with their own songs — among them, “River Deep, Mountain High,” a 1966 Phil Spector-produced hit. They also made a popular version of the Creedance Clearwater Revival tune, “Proud Mary,” which peaked at No. 4 in March 1971 and became part of their live routine for many years. It also won a Grammy for “Best R&B Vocal Performance By A Duo or Group.” In 1975, Tina first appeared in film as the Acid Queen in the adaptation of the rock opera Tommy, based on the 1969 album of that name by the British rock group The Who. Davies had her perform in the New York rock club The Ritz, and also helped establish her in Great Britain. In the early 1980s she made a version of the Al Green song ”Let’s Stay Together.” Released on Capitol Records, the song rose to No.6 on the U.K. singles charts and into the Top 20 on U.S. charts. Lionel Richie invited Turner to join his tour in the spring of 1984. Capitol Records, meanwhile, noticing the success of “Let’s Stay Together,” decided to do a whole album with Tuner in 1984 named Private Dancer. The album hit No.3 on the U.S. charts and also spawned five Top 40 singles. Worldwide, Private Dancer is estimated to have sold at least 11 million copies, with some estimates nearly double that at 20 million. It became one of the best-selling albums of all time, and put Tina Tuner squarely on the comeback trail. Also that summer, she co-starred with Mel Gibson in the film Mad Max Beyond Thunderdome and sung on the movie’s soundtrack, producing the hit songs “We Don’t Need Another Hero” and “One of the Living.” “Hero” peaked at No.1 and No.2 in the U.K. and U.S. respectively and won Turner another Grammy, this one for Best Rock Vocal Performance. In 1986, an autobiography, I, Tina, co-written by MTV news correspondent and music critic Kurt Loder, was published by William Morrow. The book reached the New York Times hardback best seller list in October 1986. A year later, it appeared as an Avon paperback peaking at No. 6 on the best seller list in early August 1987. Her sixth solo studio album also appeared that year, Break Every Rule, another big-seller, producing hit singles including “Typical Male,” which peaked at No.2 on the Billboard Hot 100 and No.1 on the United World Chart. The world tour promoting the album produced record-breaking ticket sales, including one of the single largest-paying audiences ever to see a single performer — more than 184,000 at the Maracanã Stadium in Rio de Janeiro, Brazil. Sponsored by Pepsi, the concert was also broadcast live to a worldwide audience. Tina Turner's 1986 autobiography, ‘I, Tina,’ written with Kurt Loder; re-issued, 2010. 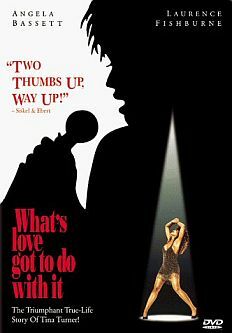 In 1993, Turner’s autobiography I, Tina was made into a motion picture using her song, What’s Love Got to Do With It?, as the film’s title. Angela Bassett played Tina and gave and Oscar-nominated performance. Laurence Fishburne played Ike and was also Oscar-nominated. 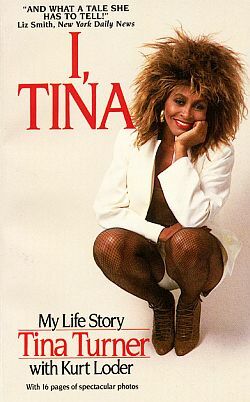 In a review of the movie, Roger Ebert wrote, “It’s a story of pain and courage, uncommonly honest and unflinching, and the next time I hear Tina Turner singing I will listen to the song in a whole new way.” The film spurred renewed interest in Turner’s music and her earlier autobiography, I, Tina, which returned to the New York Times best-seller list in July 1993 as an Avon paperback. Tina Turner, meanwhile, kept performing and became more popular than ever. Through the 1990s and into the 2000s, she continued to churn out best-selling albums coupled with very successful world tours, becoming known for her energetic performances. This tour began in February 1984 and ended in late December 1985. It was her first major arena tour and the first in her rising comeback. It consisted of three legs – North America, Europe, and the Pacific. She gave 171 shows, the bulk of them in Europe and the U.S., ending with shows in Australia and Japan. The tour was a sell out, and produced a VHS titled The Private Dancer Tour Live, which included footage from a March 1985 show in Birmingham, England with guests Bryan Adams and David Bowie. Poster & DVD cover for 1993 film about Tina Turner -- with Angela Bassett as Tina. More than 4 million fans saw Tina Turner in action on this tour, which consisted of 173 shows between March 1987 and March 1988. The shows ran mostly in Europe and the U.S., with 2 in South America, one of which was the record-setting night at the Maracana Soccer Stadium in Rio de Janeiro, Brazil that drew 186,000 fans — a turn out of Guiness Book proportions. The Rio show was also filmed and released in both VHS and DVD as Tina Live in Rio 88. In a period of six months from April 1990 through November 1990, more than 4 million fans saw Tina Turner perform in one of 121 shows in her Foreign Affair Tour, a mostly European tour with 2 shows in Asia. Undertaken in support of her 1989 album Foreign Affair, the tour helped the album sell more than 10 million copies worldwide. A performance of this tour was filmed in Barcelona, Spain and was released as a video titled, Do You Want Some Action. The European leg of the tour surpassed a tour record previously held by The Rolling Stones for number of shows in that region. Mostly a North American tour with 63 of the 72 shows held there, this tour was rolled out to help promote the soundtrack album to her 1993 biographical film, What’s Love Got To Do With It? Unlike the preceding tour which included more stadium-like setting with crowds of 100,000 or more, this tour, at Turner’s request, was geared to smaller arena-type settings, with crowds less than 25,000 so she could be closer to the audience. The tour ran from June 1994 through October 1994 and also included 3 shows in Australia and 6 in Europe. 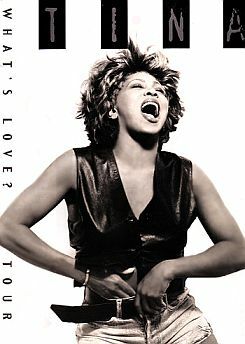 Poster for 1994 'What's Love?' tour. The Wildest Dreams Tour was a record-breaking worldwide tour by Turner, running from early May 1996 to mid-August 1997, consisting of 250 total shows, according to one source. It sold out stadiums and arenas all over the world, and grossed a reported $100 million in Europe alone and around $30 million in North America. More than 3.5 million fans saw the show, which also included 18 performance in Australia, 2 in Africa, and 2 in Asia. Consisting of 120 shows in Europe and North America, and running from March to December in the year 2000, the Twenty-Four Seven Millennium Tour was Turner’s effort to promote her album Twenty Four Seven. Released in Europe in late 1999, and February 2000 in the U.S, the album reached #9 on the U.K. charts and #21 on the U.S. Billboard 200. It reportedly sold 60,000 copies in its first week. The Twenty-Four Seven tour, meanwhile, sold out stadiums all over the world, and made more money than other touring artists that year, including Barbra Streisand, the rock group Phish, and boy band, ‘N Sync. Turner’s 95 North American shows on this tour earned more than $80 million. Tens of millions more dollars came in on this tour with her 23 sold-out international shows. When the dust cleared, more than 3 million fans saw Tina Turner perform on this tour. The Wembley Stadium U.K. concert on this tour, her last in the UK, was performed before some 85,000 fans and was filmed and released as a VHS and DVD, entitled One Last Time Live! Tina Turner during CNN interview, Feb 1997. Tina Turner during Feb 1997 CNN interview. Tina Turner interview with Larry King, 1997. During her career, Tina Turner appeared on various magazine covers, here for an October 1986 Rolling Stone feature. July 1993: Tina Turner on Newsweek’s cover. September 1996: Tina Turner featured in Ebony magazine cover story, ‘Living My Wildest Dream’. Larry King with Tina Tuner, CNN, Feb 1997. Tina Tuner on CNN's Larry King Show. TURNER: . . . Private Dancer [album] was the beginning of my success in England, and basically Europe has been very supportive of my music. KING: Hugely more – but you’re a major star here. You’re a superstar here in America. TURNER: Not as big as Madonna. I am as big as Madonna in Europe. I am as big as, in some places, the Rolling Stones. Turner told King she was not as big a star as Madonna in the U.S., but was in Europe. KING: …[D]o you realize you’re a feminist hero in America, a heroine? TURNER: . . .I am beginning to. You see, it wasn’t something that I planned. I kind of see it as a gift. Because of the life I lived, it had a meaning, and I think that the meaning was all of what is hatching now. I think that if I had not had — if I had not given the story to the world, maybe my life would not be as it is. I believe. KING: So you are aware or not aware? TURNER: No. I am becoming more and more aware. KING: Going public with that story, was that difficult? TURNER: Yes. Because I had had a lot of violence, houses burnt, cars shot into, the lowest that you can think of in terms of violence, and I didn’t know what would happen at that point because it had kind of died down and the divorce was final and my life was kind of getting back on the road, and I didn’t know what would happen. I didn’t know what kind of mess it would stir, so I — I had to really take a deep breath and make a decision. I felt somehow like getting it out — I guess it was instinct. But I felt that getting it out would be not suppressing it anymore, letting the world really know, because they were constantly talking to me about why I cannot separate. I could never tell the truth; nobody really understood, and they still don’t understand, but I think slowly now they’re beginning to. KING: Did the picture [the movie, What’s Love Got To Do With It? ] do it justice? TURNER: Yes, I think in a way. I would have liked for them to have had more truth, but according to Disney, they said, it’s impossible, the people would not have believed the truth. And I understand that. KING: They wouldn’t have believed all you had to take. KING: All right, if it’s difficult to sum up, even take some time, why did you stay? TURNER: Ike was very good to me when I first started my career. I was in high school and started to sing weekends with him, and we were close friends. We had a very fun life in some kind of way. The mistake was when. . . it became personal and wasn’t my doing, and actually I think he realizes that. Had it not become personal, we would have possibly still been together today. . .
KING: . . . It said here you turned down The Color Purple. TURNER: I denied The Color Purple because it was too close to my personal life. I had just left such a life, and it was too soon to be reminded of [it] . . . Acting for me, I need something else. I don’t need to do what I’ve just stepped out of. It was exciting and flattering I was asked by Mr. Spielberg, but it was the wrong movie for me at that time. KING: So no regrets over not doing it, even though it was a tremendous hit? Elsewhere, Turner is also quoted as saying she turned down The Color Purple film role in part, because, “I lived Celie’s life with Ike. I don’t want to live it again”. During the 1997 CNN interview with Turner, Larry King took call-in questions as he normally does, with one caller from Copenhagen, Denmark asking if Turner had any idols or favorite actors. TURNER: My one idol was Mrs. Jacqueline Kennedy Onassis. Her grace, her style, her intellect was how I modeled myself in terms of how I wanted to present myself off stage, so to speak. For my work, of course, the guys, the Stones, Rod Stewart. The rock ‘n’ roll guys. That was what I wanted and that’s what I did.. . .
KING: Did you ever get to meet Jackie? TURNER: Yes. Do you want to hear the story? TURNER: We were checking into a hotel, and for some reason she was there, and at the time she was with Mr. Onassis, and I was standing at the reception, and I looked down and I wasn’t sure that it was her. But then she made a gesture of how she usually carried her person, and before I knew it I was running towards her. I was totally out of control. And by the time I got to the swinging doors, I said, “Oh, Mrs. Kennedy, Oh, I mean Mrs. Onassis.” And she turned very gracefully, and I said, “I’m Tina Turner. I just wanted to say hello.” And she extended her hand and had this big smile on her face, and I thought, “I’m saved.” She could have been rude. . . . She could have been, but wasn’t. She was very kind. And who was rude was the lady standing with her, she was looking down her nose at me like I was some disease. She says, “Oh, hello. My children would be pleased.” [W]e had just played Hyannisport, and I had been with Robert Kennedy’s family and we had been boating and dancing with them, and so they had told Caroline and John John, and therefore, she knew who I was. And I was very excited and she shook my hand and left, and as I turned there’s Mr. Onassis, and I said hi, I had to control myself. . . . And I went to my room [and privately celebrated over the chance encounter]. I can understand now sometimes when some of the fans come [to me at performances]. I try to be as compassionate as I can because I can relate. KING: And as you explain to yourself, and you continue to lose it even remembering it. KING: She obviously was a major idol. TURNER: She was bigger than life. She was absolutely wonderful. In her personal life, Turner told King she’d found a partner in Erwin Bach, a native of Germany who she met and lived with in Germany in the 1980s. Bach, a record executive at EMI, one of the world’s largest music companies, was later moved to Zurich, Switzerland with the company, and he and Turner now live there. Turner also has a home in the south of France at Nice which she had previously bought and remodeled. She told Larry King in 1997, although she lived in Europe, she paid taxes in the U.S.
Tina Turner in a quiet, restful moment on the road. Turner also told Larry King, in response to a call-in question about which of her songs she liked the most, that her favorite was “The Best,” also known as “Simply the Best.” The song — written by Mike Chapman and Holly Knight and first released in 1988 by Welch pop singer Bonnie Tyler — is actually a love song by its lyrics. However, it has also become a wildly popular song in various sports venues, an outcome that Turner herself foresaw when she pushed her studio to do a cover version. “I felt it would be great for sport, and it ended up in many different countries [being used] for sport. I mean — my dream came true with that particular song,” she told King. But when Turner first got the idea for recording this tune, “no one believed in it but me,” she said. Turner’s version of the song was released as a highly successful single in 1989 from her hit album Foreign Affair. The single peaked at No. 15 on the U.S. Billboard Hot 100 and No. 5 in the U.K. It’s popularity in the U.K. was boosted by legendary British world champion boxer Chris Eubank who made it his theme song. The saxophone solo on the song is played by Edgar Winter. Turner’s “Simply The Best” was also adopted by tennis star Martina Navratilova and became the theme song for the late Brazilian Formula One racer, Ayrton Senna. Another version of “Simply the Best” that Turner recorded in 1992 as a duet with Australian rock star Jimmy Barnes, became a Top 40 hit single in Australia, where it was also used in a promotional and advertising campaign for the New South Wales Rugby League, Australia’s professional rugby league football. That campaign brought a great deal of interest to the league and its games. Turner performed the song at the 1993 New South Wales Rugby League premiership’s Grand Final. A rugby league video version of the song was also released around that time and remained among Australia’s top ten videos for some weeks thereafter.“Simply The Best” has been used in TV ads, to honor sports stars, for celebrity tributes, political campaigns — and more. In April 2006, the National Rugby League of Australia and New Zealand announced that Turner would return in her popular promotional role for the league in 2008. In U.S. sports, the song has been used in wide variety of settings and ceremonies honoring athletic achievement: when the San Francisco 49ers retired quarterback Joe Montana’s jersey; when the Pittsburgh Penguins retired Mario Lemieux numeral 66; and when the Philadelphia 76ers retired Allen Iverson’s numeral. In the 1994 Stanley Cup Finals, the song was played over the PA system at Madison Square Garden when the New York Rangers beat the Vancouver Canucks in Game 7. In September 2007, the song was used by the New England Sports Network when Boston Red Sox rookie pitcher, Clay Buchholz threw a no-hitter at Fenway Park against the Baltimore Orioles. In Japan, pro-wrestler Osamu Nishimura has used the song as entrance music. HBO has used the song for years in advertisements previewing shows and movies, unofficially becoming something of a second HBO theme. In 2004, actor Jim Carrey performed a few lines of the song in tribute to Meryl Streep during her AFI Life Achievement Award ceremony. In 2008, then U.S. Senator Joe Biden used Turner’s recording of “Simply The Best” as his presidential campaign theme song. Conservative radio’s Rush Limbaugh has also used Turner’s version of the song in his bumper music rotation, and the pharmaceutical company SmithKline Beecham has used the song as well. DVD cover of concert filmed at Wembley Stadium in London, U.K., year 2000 tour. Although there are few second acts in any lifetime, Tina Turner is among those who have defied the odds by having a very successful one, adding to her earlier accomplishments. In her musical career, she has received eight Grammy Awards and was nominated for another 12. To date in the U.S., she has had seven Billboard Top Ten singles and 16 Top Ten R&B singles. In the U.K. she has had more than twenty Top 40 hits. Among her various music and other awards are the following: the American Music Award, the Billboard Music Award, the NAACP Image Award, MTV Video Awards, and the World Music Award. In addition to being a Kennedy Center Honoree in 2005, she is also a member of Rock & Roll Hall of Fame and has a star on the Hollywood Walk of Fame. She was ranked No.2 on VH1’s 100 Greatest Women in Rock & Roll, and No.51 on Rolling Stone’s “Immortals” list. Although she retired from global touring in 2001, she has continued working. In 2003, she teamed up with Phil Collins to record the song “Great Spirits” for the Disney film Brother Bear. Her 2004 greatest hits album, All the Best charted in both the U.S. and the U.K., spawning a new single, “Open Arms,” which reached the Top 25 in the U.K. In 2005, she gave live TV performances in the U.S. and Europe and also appeared at a private charity ball in St. Petersburg, Russia. In addition to receiving Kennedy Center Honors, already mentioned, she was also named in 2005 as one of Oprah Winfrey’s 25 legends honoring outstanding African American women. In early 2006, the All the Invisible Children soundtrack was released with Turner and Elisa singing “Teach Me Again,” a song which hit No.1 in Italy. In recent years, she has also contributed to albums by guitar legend Santana and jazz pianist Herbie Hancock (a tribute album to singer Joni Mitchell). In 2007, Turner was also working on an album of new material. In May 2007, Turner returned to the stage to headline a benefit concert for the Cauldwell Children’s Charity at London’s Natural History Museum. And in February 2008, she performed at the Grammy Awards ceremony. President George W. Bush congratulates Tina Turner during a reception for the Kennedy Center Honors in the East Room of the White House Sunday, December 4, 2005. From left, the honorees are: singer Tony Bennett, dancer Suzanne Farrell, actress Julie Harris, actor Robert Redford, and singer Tina Turner. White House photo, Eric Draper. November 1997: Courtney Love, Tina Turner & Madonna share Rolling Stone magazine’s “Women of Rock” cover & 30th anniversary issue. Tina Turner on the cover of her 2004-2005 “All the Best” album – a greatest hits compilation released in the U.K. as a two-disc set in November 2004, followed by a February 2005 release in the U.S., and an abridged single-disc version in October 2005. Sara C. Medina, “People,” Time, September 8, 1986. Mike Joyce, “Tina Turner, Typically Torrid,” Washington Post, August 25, 1987, p. D-8. Richard Harrington, “Public Danger: Tina Turner’s Turbulent Life Comes to the Screen,” Washington Post, June 6, 1993, p. G-1. Janet Maslin, “What’s Love Got to Do With It; Tina Turner’s Tale: Living Life With Ike and Then Without Him,” New York Times, June 9, 1993. Desson Howe, “Love: It’s Got to Do With Grit,” Washington Post, June 11,1993, p. N-42. Bernard Weinraub, “As Tina Turner, Wig to High Heels,” New York Times, June 23, 1993. Geoffrey Himes, “Tina Turner,” Washington Post, August 2, 1993, p. B-4. Richard Harrington, “Tina Turner’s One-Woman Festival,” Washington Post, June 23, 1997, p. D-7. Richard Harrington, “Tina Turner: The Girl From Nutbush,” Washington Post, July 29, 1993, p. C-7. Robbie Woliver, “Queen of Comeback Talks of Retirement,” New York Times, June 11, 2000. Richard Harrington, “Proud Tina Keep On Burnin’,” Washington Post, June 16, 2000, p. C-2. Megan Rosenfeld, “Please Tina, Keep on Burnin’,” Washington Post, October 9, 2000, p. C-5. Janet Jackson, “#61 – Tina Turner,” Rolling Stone, 972, April 21, 2005. Jacqueline Trescott, “Kennedy Center To Honor Five High-Wattage Cultural Lights,” Washington Post, September 7, 2005, p. C-1. Teresa Wiltz, “Big Wheels Turning: For a Star-Studded Night, Tina Turner and Four Other National Treasures Rule on a River Called the Potomac,” Washington Post, December 5, 2005, p. C-1. Tara Hayes, “Turner Is Simply The Best For NRL,” B&T (Australia media & advertising magazine), April 11, 2006. “Tina Turner on Larry King,” YouTube.com, Uploaded, April 25, 2007, by keyhunters.